So here I am stricken with the stomach flu, which is probably my worst nightmare. Not only am I limited by the types of food I can eat, it comes out shortly like a waterfall (sorry for the visual). Courageously, I dragged myself into work today knowing there was a washroom less than 20 feet away. I'm quite a determined person and something as trivial as a Gastroenteritis won't get me down. I thought of the last time I had the stomach flu and coincidentally, it was roughly a year ago. Undeterred, I defiantly had McD's, Viva Sue Pizza and Beard Papa's. Yes, I figured if it was coming out anyways, I'd eat the greasiest, crappiest and highest caloric food out there. Of course, that came at a price and I will spare you the details. Today for lunch, I convinced Pomegranate that we should go for fish 'n chips. Yes, that's right. Fried, greasy and dipped into tartar sauce, this was my defiance in full effect. I will take this stomach flu head on and show who's boss! 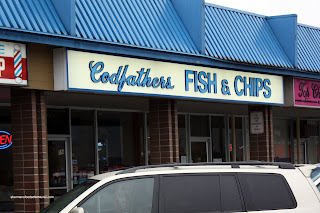 We made our way to Codfather's out in Burquitlam. For a fleeting moment, I considered the AYCE fish 'n chips with bottomless pop... Alas, I am defiant, not crazy! Rather, we both went for the lunch special which consisted of a bowl of Seafood Chowder and 1 piece Cod 'n Chips. We tacked on a side of Halibut for good measure. Ah yes, nothing like a bowl of creamy, fatty seafood chowder for the stomach ailments. I'm sure if my stomach could talk, it would be asking #$O#E$(#U I'm doing? 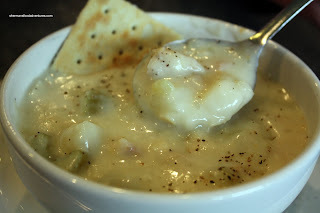 Well, the chowder was indeed creamy and full of scallops and fish. I didn't detect any clams or clam flavour (possibly there weren't any clams or very few?). That would probably be my only complaint, a lack of seafood flavour; but otherwise a solid seafood chowder. Okay, we were expecting one piece cod and halibut respectively; but when the platter arrived, we were completely shocked at the portion. Look at it. Either they don't know how to count or the owner was extremely generous. My theory is that he noticed my camera and gave us more? However, I could be totally wrong. 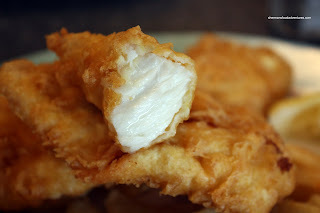 Whatever the case, the fish was flaky and fresh with a very light batter. I wouldn't say it was devoid of grease (since it is deep fried), but it wasn't too greasy. The fries were pretty good being crispy while still maintaining the qualities of a potato. We weren't that enthused with the tartar sauce though. It was a bit bland and a bit more zing was in order. But other than that, it was a pretty satisfying meal of fish 'n chips. LOL... Thanks EnbM! I'm totally over it, this was over 2 weeks ago! Hehe... But I refuse to let it prevent me from eating! I'm stubborn! Thanks Valerie! This was a couple of weeks ago, so I'm fine now! goodness, you're brave. when i have the stomach flu i eat vegetable broth and plain toast - nothing else! 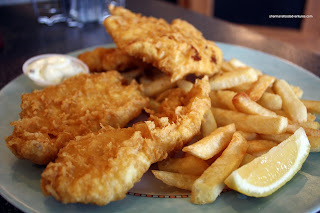 i have a fish & chips craving now. i like that they gave you a piece of lemon - small but nice touch. i find most places don't. I have not... Now I shall try it!